Putting on extra policemen to stop the increasing violence on the streets in Groningen. During the last elections it was an important issue. ‘More blue on the streets’ (dutch police wear blue uniforms) was ‘the’ answer to the street violence thought a lot of political parties in Holland. PIEK! disagreed. After riots in a district in Groningen it was obvious that the police was sometimes powerless . And as an answer to those riots the politicians just wanted to open another can of policemen, because the people in the streets didn’t feel save anymore and wanted to see more ‘blue on the streets’. So PIEK! 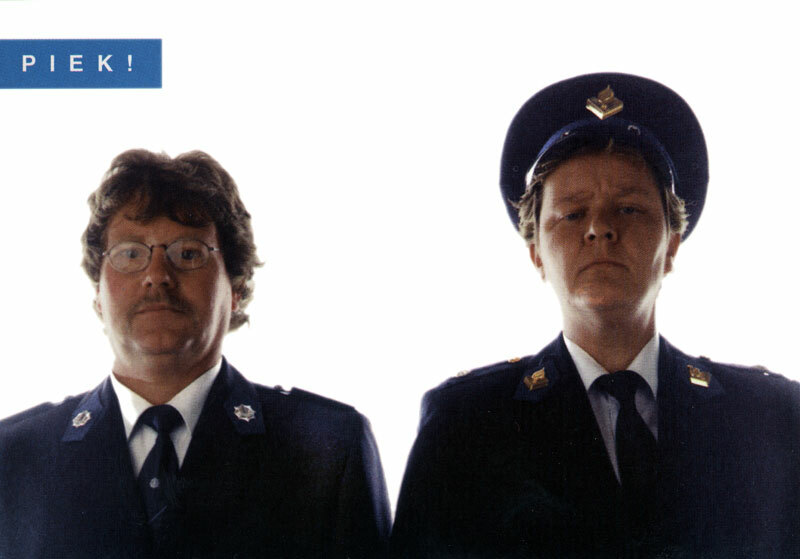 decided to make posters, in Toscani style, with two policemen on it, and hung them all over the city. A couple of hundred of these posters would make the people feel saver. At the same time 120.000 free-cards with this picture were spread in pubs, discos and libraries etc.